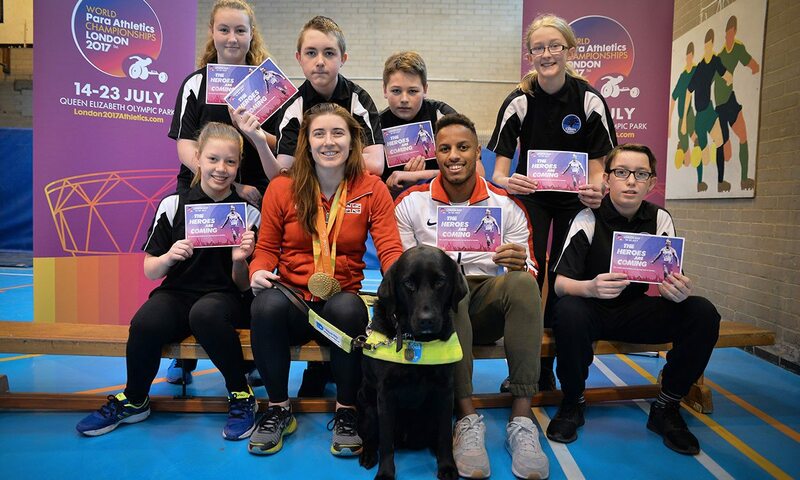 Following the success of the London schools ticket offer for the World Para Athletics Championships, double Paralympic champion Libby Clegg has launched a nationwide roll-out to give all schoolchildren across the UK the opportunity to attend this summer’s event. More than 1000 schools across every London borough applied for over 90,000 tickets during the initial window of the ticket offer. Now Clegg, who won T11 100m and 200m gold medals at the Rio 2016 Paralympic Games, and her guide runner Chris Clarke have officially extended the opportunity nationwide following a visit to The Cedars Academy in Leicester on Friday (March 3). The offer creates the opportunity for tens of thousands of schoolchildren from across the UK to experience a once in a lifetime trip to attend selected sessions of the World Para Athletics Championships, taking place from July 14-23 at the London Stadium at the Queen Elizabeth Olympic Park. Visually impaired sprinter Clegg, who is set to compete during the available schools sessions, said: “This is a great opportunity for schools nationwide to be part of the biggest sporting event in the world in 2017. “I really enjoyed visiting The Cedars Academy today with Chris and their enthusiasm for the Championships was contagious. Tickets cost just £3 for schoolchildren, with accompanying adults and teachers able to attend for free. Sessions available are the evenings of Monday July 17, Tuesday July 18 and Wednesday July 19, and to meet the overwhelming demand organisers have also made the morning of Sunday July 16 available for schools attendees. Niels de Vos, championship director for the World Para Athletics Championships London 2017, said: “We’re thrilled to be in a position to invite schoolchildren from across the country to what will be an incredible sporting event. Applications are being accepted until 20:17 on March 24 at www.paraathleticschampionships.com/TicketsForSchools and will be open to all UK primary and secondary schools. For schools outside of London wanting to provide a school trip to pupils including travel, accommodation and a ticket to the World Para Athletics Championships, organisers are working with Sport Experiences to provide options for schools travel packages. See www.sportexperiences.co.uk/PB1LPA01/world-paraathletics-championships-london-2017. The ticket offer is just one part of a comprehensive schools programme launched for the Summer of World Athletics. In January, organisers launched Starting Blocks as the official education programme for both the World Para Athletics Championships and IAAF World Championships – a digital hub providing free, curriculum-linked resources for teachers of pupils aged five to 14.